Quick Order for wholesale customers of Greenleaf Nursery. The Quick Order form can be modified to meet your specific requirements. For NVK, a 25+ volume pricing column has been added. If you're customers know what they want, the Quick Order is a great way for them to quickly place their order on your website. 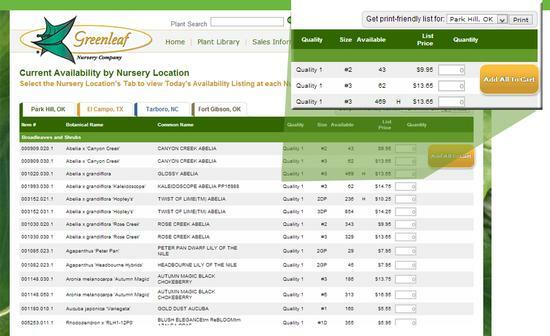 They can scroll through to find the plant they're looking for or use the Quick Search to immediatelyb find the plant they want to purchase. If you have inventory availability implemented, the quick order can also ensure that your customers do not order more product than you can ship. Customers are in Price Groups and each product has a price for each price group. Percentage off of a standard price. For example, customer A receives 2.23% discount off of standad wholesale price while Customer B receives a 1.3% disscount and Customer C pays standard wholesale price. 'Hand Pricing' by customer. 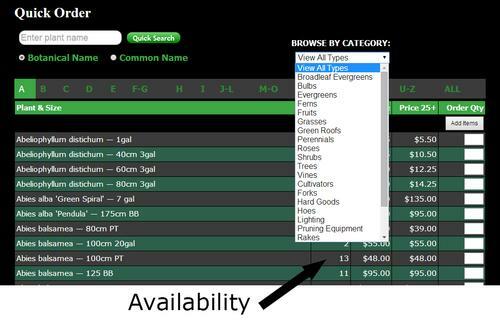 You can load customer specific pricing for each and every item you sell. We would be happy to chat with you about your pricing to figure out the best customized pricing solution. An e-mail will be sent to the address of your choice notifying The orders are stored in the Clarity Console Online Store Manager. We can integrate the store manager with various business systems including Oracle and QuickBooks so orders can be automatically synchronized. Let us know if your interested in this functionality and we will work with you to understand the requirements and the submit a proposal for the additional functionality.